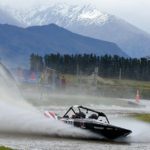 Defending New Zealand SuperBoat champion Peter Caughey crossed the start-line in a brand-new boat today, and bagged the fastest time every time he took to the water at Wanaka’s Oxbow Aquatrack. Even this seasoned racer was taken by surprise at just how well the new engine, hull and jet unit worked. But the day wasn’t an easy one, due to very changeable conditions, with sunshine, wind and rain passing through all day, and sometimes within an hour, with high winds, if not a lot of rain until just before the finish. That complicated racing on a technical rotation, the hardest Caughey has seen at the Oxbow Aquatrack, with several ‘money’ corners prompting crashes all day. And it was a spectacular crash which stopped the event, when Simon Gibbon’s Novus boat left the water, and flew into the boundary fence, damaging the fencing and taking out the power lines vital to work the timing gear. As the crew was extracted – and confirmed to be okay – the rain really came down, and as all classes had completed that top-nine elimination, the event was called, and results based on placings from the completed elimination round. That put Ted Sygidus in third, an Australian who flew in to race his Sprintec boat for the event, with Sam Newdick – racing Caughey’s previous motor, and settling in well with a new package at its first race – in a healthy margin ahead, in second. “That put our three most recent boats on the podium,” says Caughey, the mastermind behind the Sprintec business. “We aim to design boats that are tunable to all sorts of tracks and water conditions. This track has a lot of lift and boats generally feel a bit loose here, which is what likely contributed to several crashes today, but it’s the same track that we all have to race, and we have to work around that,” he says.